Amazon is offering $200 to $600 instant rebates on select VIXIA HD camcorders. 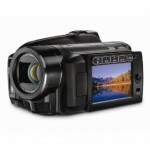 The HF S100, HF200, and HG21 all record 1080p full HD video at either 24p Cinematic or 30p Progressive mode. All three camcorders also offer external microphone or light attachment, using the advanced mini accessory shoe. 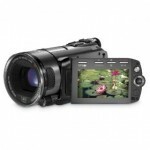 The Canon VIXIA HF S100 is a high-definition Flash memory camcorder with 10x optical zoom. The camera records at both 24p Cinema Mode and 30p Progressive Mode at 1920 x 1080 full HD. It features the SuperRange Optical Image Stabilizer and 8.0-megapixel digital camera functions. List price of the S100 is $1,099. You just have to add-it-to-cart to see the price with $200 discount. 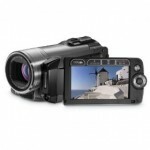 The Canon VIXIA HF200 HD Flash memory camcorder has a 15x optical zoom with SuperRange Image Stabilizer. The camera records 1920 x 1080 full HD at either 24p Cinema Mode or 30p Progressive Mode. Built-in digital camera uses a smaller 3.3 megapixel CCD. List price is $749, but adding-it-to-cart will instantly discount it down to just over $500. The Canon VIXIA HG21 AVCHD (pictured above) records to a 120GB hard drive for up to 45 hours of high-definition video. The Canon 12x optical zoom lens is enhanced by SuperRange Optical Image Stabilization. The HG21 records in both 24p Cinematic and 30 Progressive modes at 24Mbps, the highest bit rate for AVCHD. This camera normally retails for $1,299 but is currently offered at $699 after $600 instant rebate. Check out full specs for this camera. Just bought the Canon VIXIA HF200! I cannot wait! Great site BTW!! Thanks for a good blog. I will be buying the HG21 from Amazon in a couple weeks. This camcorder had great reviews. All the best.